For many of us, Christmas is not only a wonderful holiday to celebrate, but also a great opportunity to explore and enrich our creativity and cooking skills. Although paper snowflakes or sparkly baubles might be fail-proof Christmas decorations we all can make as long as we have the necessary supplies handy, DIY organic Christmas decorations will definitely be a bigger hit in any home. They are not only visually-appealing, but also particularly tasty, and a good way to protect the environment against pollution. Just imagine hanging gingerbread cookies in your Christmas tree – wouldn’t that be just perfect? We will show you 10+ superb organic Christmas decorations you will fall head over heels for. Apples are not only healthy and abundant in antioxidants, but also extremely appealing, especially when used as Christmas decorations. 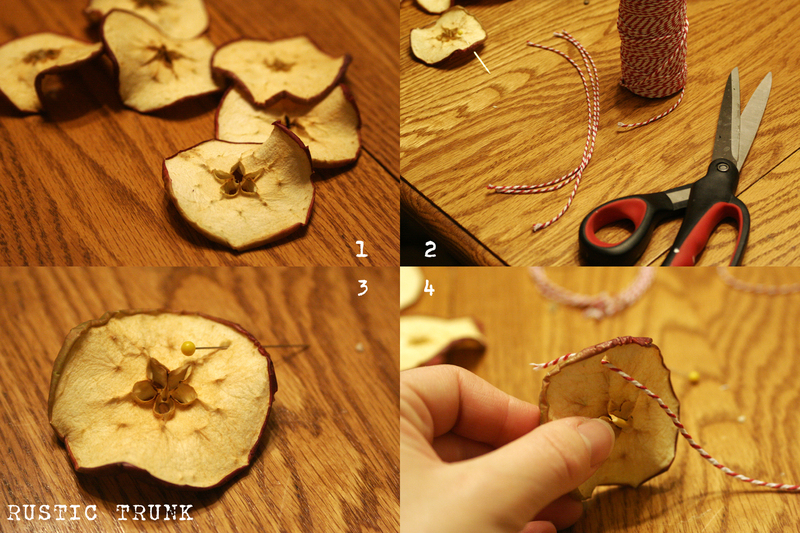 For this particular ornament, you will have to cut several apples in half horizontally instead of vertically – you will notice that the 5-seed cavity will form an open star in the center of the fruits. Now cut each half into round, 1/4-inch thin slices, and dry them using either your oven or a food dehydrator. Equip yourself with patience, as the drying process is going to take about 10 hours if you are using the oven, and a little shorter if you went for the dehydrator. If you want to add a bit of exoticism to your home on Christmas, you can opt for using starfruits instead of apples, which will most definitely enhance the appearance of your rooms. Thinly slice the starfruits so that their star-shaped outline is exposed, and dry them as instructed above. You can put both the apple and starfruit stars in a bowl, or threat a string or a piece of ribbon through the edge of each slice in order to make them look more interesting. Did you know that drying lemon, orange, and lime slices will cause them to gradually become almost translucent? You can create wonderful citrus “windows” that will beautifully decorate your house on Christmas, and the best part is that you can use what citrus fruits you want depending on the colors you would like to obtain. Cut 1/4-inch thin slices of each fruit, and dry them as if you were drying apples or starfruits. To add variety to your DIY Christmas decorations, stud the peel with whole cloves, cutting the slices a little thicker than 1/4 inches. Use them to decorate the Christmas tree, or create fresh centerpieces, which will most definitely enhance any holiday table. 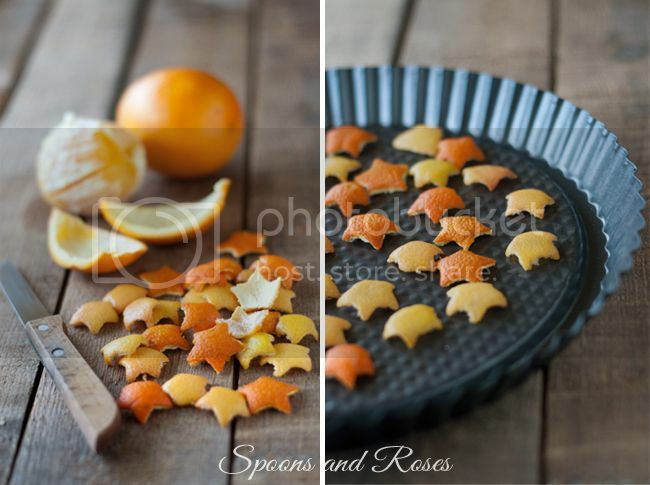 Citrus peels are not only full of vitamin C, but they also dry nicely, and can make wonderful flowers or stars you can use to decorate your home on Christmas. Cut any citrus fruits you have handy in half, and scoop out the pulp with a spoon. Using a sharp pair of scissors, make evenly spaced cuts from the rim of the fruits about 2/3 of the way down towards their bottom. Flatten the cut peel carefully, otherwise they might snap, ruining your efforts. Use the scissors to shape the sections you have obtained after first cutting the peels into star points or flower petals. At this point, you will have to dry and completely flatten the citrus peels so they are ready to be used as decorations. But before you do this, thread a string or ribbon through one of the sections, which will enable you to hang the stars or flowers wherever you want. Spread layers of newspapers on a flat surface, arrange your citrus shapes on them, cover them with another layer of newspapers, and then stack books or magazines on top. You can expect them to be completely dry and flat in a few days up to one week. If scooping the pulp out of an orange or lemon seemed difficult, cutting their peel into a single strand is going to be probably the biggest challenge of your life. However, it will certainly be worth the struggle since you will be able to use the strands to create splendid and beautifully perfumed roses out of the citrus peels. Use a small, sharp knife in order to cut the strand thinner, and start cutting the peel from the top of the fruit to the bottom, moving slowly and carefully to avoid accidentally cutting it shorter. Do this with both lemons and oranges, so you can add variety to your home. When you are done, curl or twist the peel strands to obtain beautiful roses. Nothing compares to the visual appeal of citrus sachets – they are good-looking, original, and can help you reduce waste substantially. To make these baskets, you will have to cut the open a small hole at the top of your citrus fruit, and remove as much pulp as possible without tearing the peel. Use a paring knife to cut small slits into the sides, which will make your sachets more aesthetically pleasing. Refill the fruit with cinnamon or rose hips, which you can use later to make tea. Thread a string or ribbon at the top so you can hang your citrus sachets wherever you want. Gingerbread cookies are very common when Christmas is around, and the best part is that you can always use them to beautifully decorate your home as well. Find your favorite gingerbread recipe, then proceed to baking the cookies, but only after you have cut the dough into different shapes, such as stars, Christmas trees, snowmen, snowflakes, and much more. This will make your cookies look much better, and will help you enhance the Christmas atmosphere of your home too. Use colorful decorative pencils for cakes in order to make your gingerbread cookies look special. Once they are ready to be served, carefully thread a string through the cookies, so you can also hang them in your Christmas tree. If you do not like using string or thread, go for ribbon instead, as it is more visually-appealing and elegant at the same time. If you are looking for a nice gift wrap for a tiny necklace or ring, why don’t you ditch the boring gifts in favor of walnuts? Besides containing important nutrients and healthy fats, walnuts can make magnificent gift wrap, featuring a unique approach your loved ones will surely appreciate. Take a couple of walnuts, empty their inside, and add a little glitter to make them sparkle. If you are going to fit a necklace, ring, earrings, or other such jewelry, you should better put a lining inside the walnuts, to keep your little pretty safe. Wrap the walnuts with ribbon colored in your favorite shades, and you are done. If you do not want to use walnuts as gift wraps, you can always repurpose them as DIY organic Christmas decorations. Place a few of them in a bowl or a similar container, and put inside various candies, sweets, or other such goodies. Meringues are probably some of the simplest and sweetest goodies you can make, and the best part is that you can always turn them into wonderful wreaths or baubles for Christmas. Before you throw your hard-earned money on a boring wreath that is nothing different from the one you had last year, why don’t you take the sugar, white eggs, and some salt, and cook some meringues? You can buy some colorants if you want to add variety to the wreath, and then carefully pour them on a baking tray using a tablespoon. Pour the meringues into a circle, so that each of them is glued to the ones at its sides. When they are done cooking, use a ribbon to hang them as wreaths or baubles in your Christmas tree. If you need a unique – and tasty – centerpiece for your Christmas table, a box made of gingerbread is going to definitely be a great option. To create one, you will have to either gingerbread cookies or bake your own, making sure to shape them square. To keep the “walls” of this support together, you will need a stiff paste made by whisking eggs until froth, then adding sifted icing sugar. Glue the walls together using this paste, then enhance the visual appeal of your fondant support using tiny sugar pearls. Let the support set for up to three hours, then fill it with your favorites fondants and chocolates. One lovely DIY organic Christmas decoration you can try making is a table centerpiece with sparkling Christmas trees. They can be used either stand alone, placed directly on a special plate, or to decorate a cake, as they will surely make it look more delicious. To make these sparkling Christmas trees, you will need ice cream cones, a mixture of butter and sugar, and some caster sugar, tiny sugar pearls, or coconut flakes to decorate them. Mix the butter and sugar well, then spread this mixture on the ice cream cones. Sprinkle the caster sugar, sugar pearls, or coconut flakes on them until they are completely covered. If you will not be using them to decorate a cake, you should enhance this winter landscape by adding “snow” on the plate or support where you are going to place them on. You can use a combination of coconut flakes, sugar pearls, and caster sugar for this, or stick to only one of these decorations. Perhaps you want to buy a snow globe to ornate your home with, but you do not have the money for this. A much better alternative is making gingerbread snow globes instead, which are going to ramp up the visual appeal of your home, making it smell and look sweeter. You will not need specific cookie shapes for this, as you should be able to cut the dough similarly when cooking the gingerbread. When they are cooked, proceed to decorating them, so they will look like real snow globes. Use blue to create the glass, and add two stripes of white to give the illusion of reflection. To make that human shape, you can either use chocolate, or glue a small gingerbread man to the initial snow globe cookies after you have colored the glass. Ornate him with a green collar, white buttons, two eyes, and a mouth, then add white sugar pearls around him as well as above him, to make it look like it is snowing. Crate a fictive support for the snow globe by coloring the sharper part of the cookie with red, then creating some random shapes. Find some suitable supports for these snow globes, so you can place on the table or other surfaces, and create the impression that they are real. What if you could have your own forest of Christmas trees right on your table? Creating some adorable Christmas tree pots will be a great way of decorating your table for the upcoming holidays, and they will certainly be a unique idea everyone will appreciate. Start by baking cupcakes – any recipe will be fine, but no matter which one you go for, make sure to stir in red colorant before putting them in the oven. While they are baking, prepare the icing by mixing butter, softened cheese, sugar, vanilla extract, and freshly grated nutmeg. Leave it in the fridge until the cupcakes are baked and cooled. When the cupcakes are done, you will have to make the Christmas trees, and we suggest prepping for some extra efforts, as this is not going to be an easy job. Take a couple of ice cream cones, and spread each one with a thin layer of green frosting. Fill a pastry bag with the same green frosting, and start creating “stars” on the trees, going up from the base of the cones to the top. You can decorate the trees with sugar pearls, or create little round balls that resemble ornaments using a pastry bag filled with white, red, or blue frosting. Going for organic DIY Christmas decorations is going to be much better than throwing your money on expensive plastics that do not last very long. Not only can you use your creativity in order to make countless ornaments, but you can also improve your cooking skills, and enrich your aesthetic sense at the same time. To top that off, these decorations are much cheaper, and will make your home look sweeter, feel more familiar, and smell fresher.